Simple Veg | eat. live. paleo. 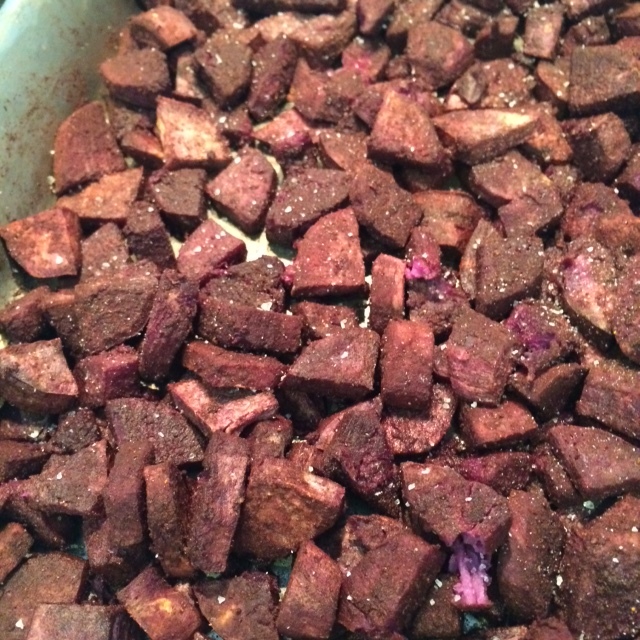 ‘Tis the season for organic purple sweet potatoes! David and I love having roasted sweet potatoes in the fridge, which make for a great post-workout snack and snack in general. And when we can get purple sweet potatoes? Even better! 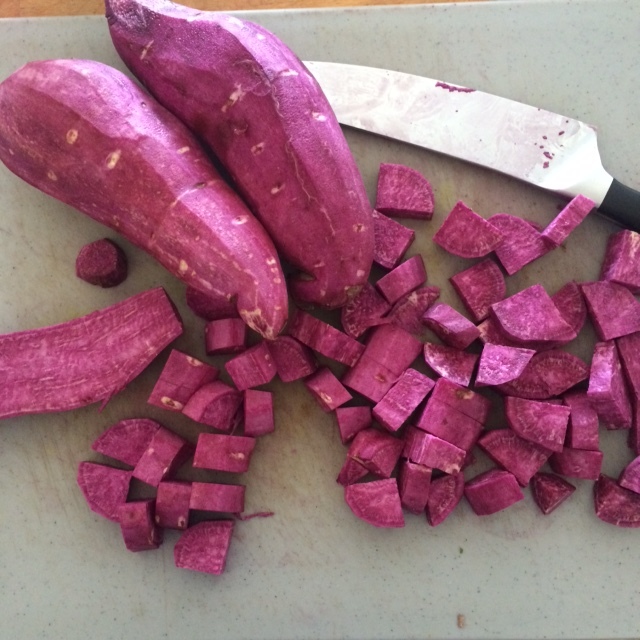 Purple sweet potatoes are wonderful — they are drier and denser than your regular sweet potatoes or yams, have a balanced sweetness and are packed with antioxidants. I like to chop them up in small pieces (about 1/2 in. 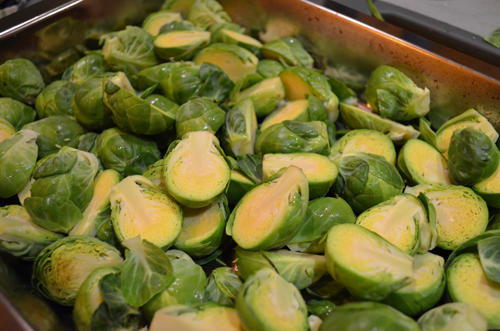 by 1/4 in), coat them in cinnamon with a sprinkling of cayenne, garlic powder and salt, and roast them with coconut oil. The coconut oil and cinnamon highlight the sweetness of the potatoes, while the garlic powder, cayenne and salt bring out the savory qualities. I eyeball the spices, and roast them at 400F until the potatoes are cooked through. A fork test always works best to make sure the potatoes are cooked. 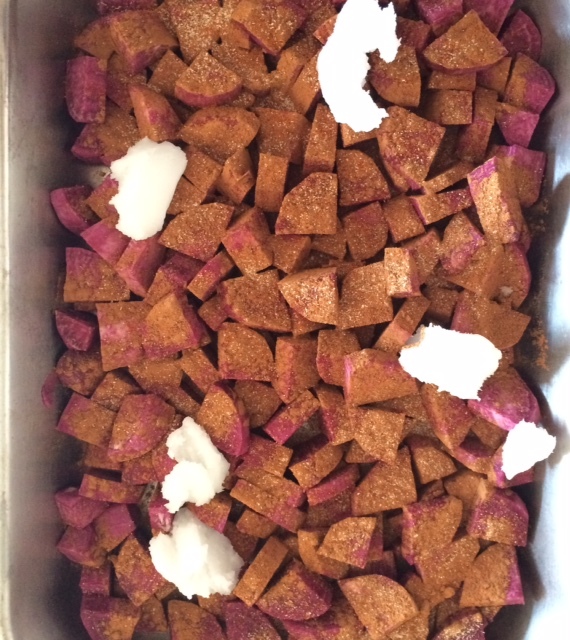 Today, I chopped up 3 large purple sweet potatoes, tossed them in cinnamon, cayenne, garlic powder and some salt, and plopped on about 3 tablespoons of coconut oil. I find it easier to toss the whole mixture together once the coconut oil melts in the oven after a few minutes. Once in the oven, I mix the potatoes around every so often, making sure that the pieces are coated evenly with the coconut oil, and roast them for about 45 minutes. Voila! I sprinkle a little bit more salt once the potatoes are out of the oven. The potatoes keep very well in an air-tight tupperware for a week or a bit more. They are great cold, and I eat them after my workouts or when I’m craving something sweet. Roasted sweet potatoes have become our must-always-have foods in our fridge these days, and we LOVE them! 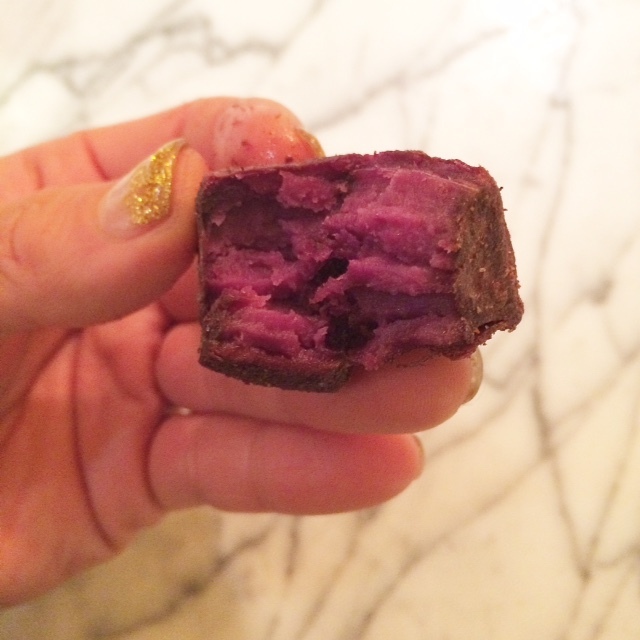 Check out this purple sweet potato beauty right out of the oven! Radishes are not something we normally buy or eat. I tend to think of them as a slightly bitter “garnish-y” type of vegetable, eaten raw, not particularly exciting. But I recently came across a picture of roasted radishes on a food-related website, and it piqued my interest — I’d never thought of roasting radishes before! I am a big fan of roasted vegetables of all variety. And so with haste I picked up 2 bunches of radishes and tried roasting them. The result? I LOVED them. 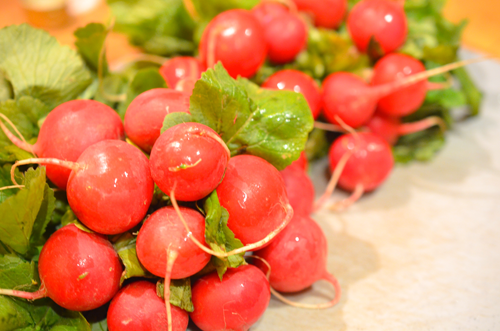 Who knew radishes would turn deliciously juicy and sweet when roasted? I think roasted radishes will make more appearances at our dinner table from now on. I kept the leaves and added them near the end, which cook up nice and crispy to provide some texture to the radishes. All in all, I am impressed with this new, simple way of eating radishes. ‘Tis the season for winter greens! I recently found on sale these these little bunches of black Tuscan kale, locally produced by Satur Farms. They are smaller than your more typical kale, and have a bumpy, crinkly surface. In the past, David hasn’t been the biggest fan of kale — he finds kale bitter and its stems too tough. I thought I’d give the black Tuscan kale a try anyway, mostly because they looked pretty. Surprisingly, David LOVED the black Tucan kale and couldn’t get enough of it! The black Tuscan kale has an earthier, almost sweeter flavor than the large type of kale, and the texture is lovely — the leaves are soft but not mushy . After blanching the kale, I cooked the leaves very simply with sauteed red onions and garlic — a perfect pairing with a pork chop. 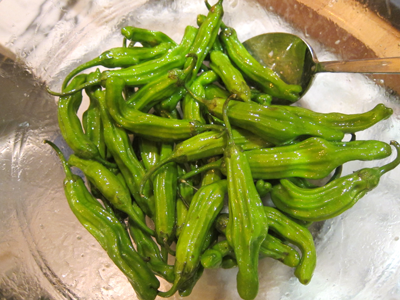 I love grilled shishito peppers, and am able to eat great quantities of them in one sitting. Grilled shishito peppers appear to be trending at restaurants these days, which is understandable as they make for great bar snacks. If you come across good looking shishito peppers (I found some at Fresh Direct recently), it’s super easy to make them at home. Duck-fat-fried anything is delicious. Rich, yes. Probably not ideal for your waistline, yes. But occasionally? Fabulous. Often, when I sear duck breasts, I strain out the fat and keep it refrigerated in a glass jar. 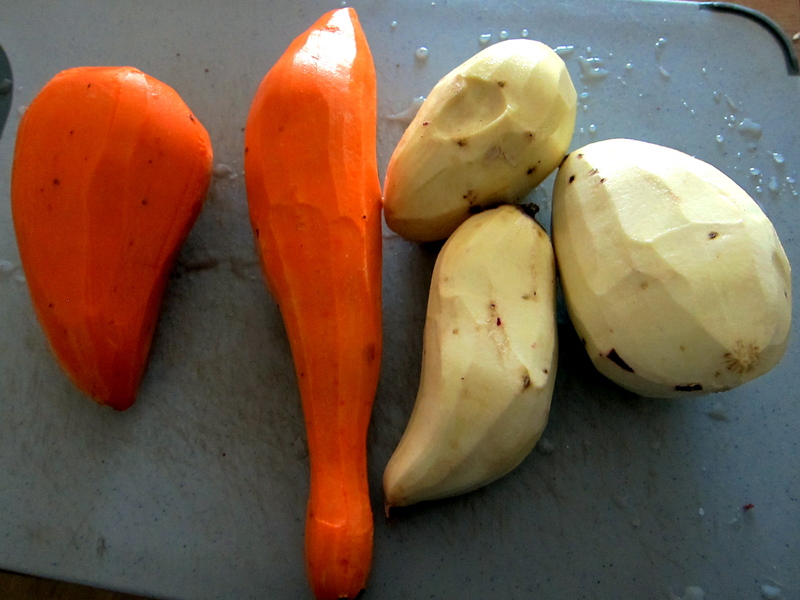 Recently, I came across organic garnet yams AND organic Japanese sweet potatoes on Fresh Direct. David had wanted to have more sweet potatoes available for snacking purposes, and so I thought this was a good time to try…yams and sweet potatoes cooked in duck fat. Peel the yams and sweet potatoes — I used 2 yams and 3 sweet potatoes. Chop them into pieces, about 1 inch cubes. Finely chop one onion. In a skillet on medium-high heat, heat about 2 tablespoons of duck fat. Once it melts, stir in the potatoes, making sure to coat them in the fat. Salt and pepper. After a few minutes, add the onions. Stirring frequently, cook the potatoes until the sides begin to sear and turn brown. Put the skillet in the oven to finish cooking. 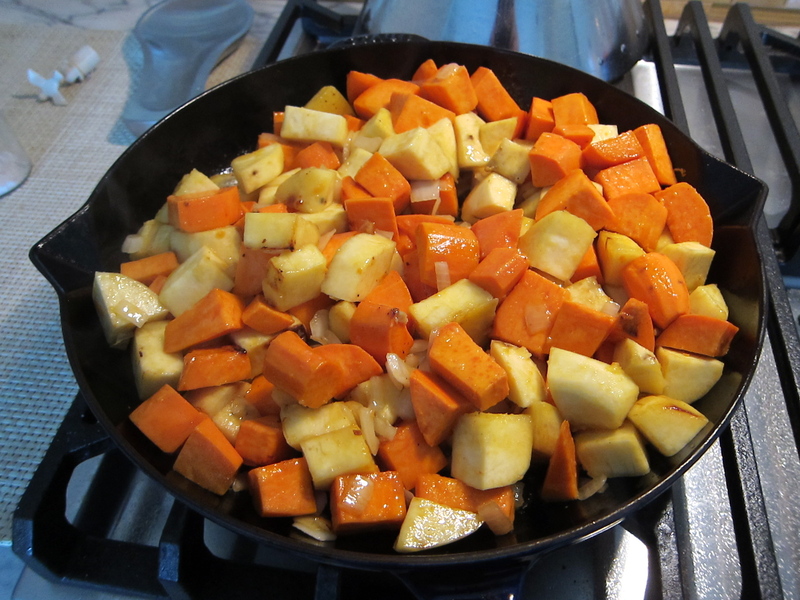 (Note: I discovered that the Japanese sweet potatoes cook faster than the yams, which I didn’t expect.) Stirring occasionally, cook until the yams are cooked and a fork goes easily through it. You might want put it under broil it for a few minutes to brown the potatoes a little more. Adjust the seasoning if needed. 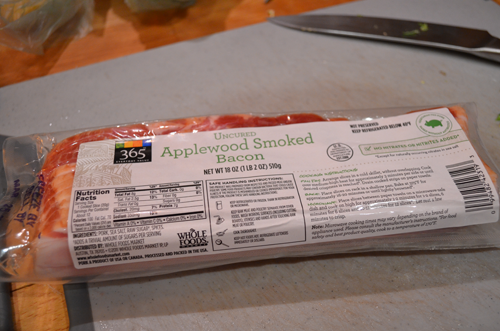 The result was more like a chunky hash than “fried” potato pieces — which suits us fine. The caramelized onions go nicely with the sweet potatoes. The duck fat definitely adds the flavor, but the potatoes do not come out greasy at all. 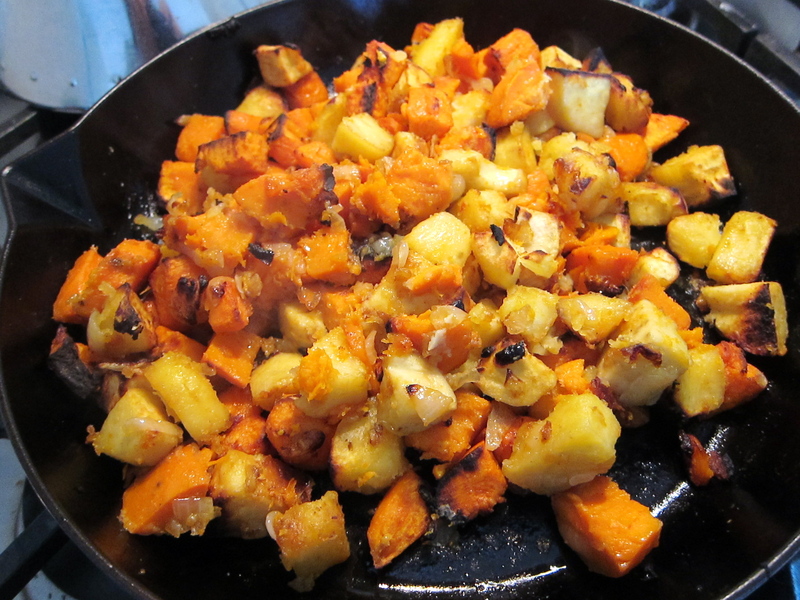 Savory and sweet at the same time, this yam/sweet potato concoction turned out delicious! We’ve found gorgeous organic, heirloom mini-tomatoes here in Stockholm — perfect for making my “Mediterranean salsa” even more colorful! This “salsa” is great alongside meats (pork chops, steaks), as a dip (with gluten-free crackers, for instance), or with eggs (fried or scrambled). Very simple to make, and tasty. 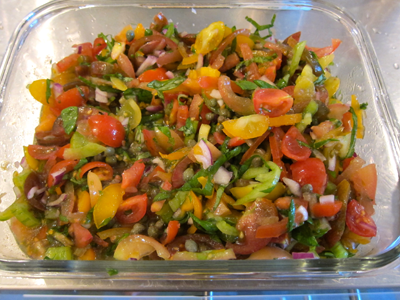 In a large bowl, mix together: chopped up the tomatoes; a small red onion, minced; finely mince jalapeno pepper (less or more depending on your tolerance for heat); a big handful of basil, chiffonade; and 2 tablespoons or so of capers (depending on how much you like capers). Squeeze in the juice of one lemon. Drizzle some olive oil, and season with salt to taste. 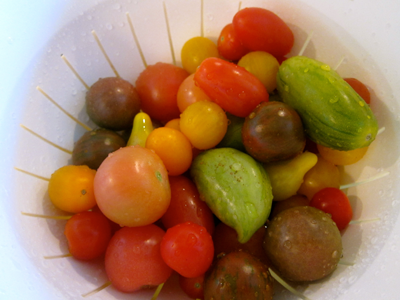 P.S.> No need to use heirloom mini-tomatoes, of course. 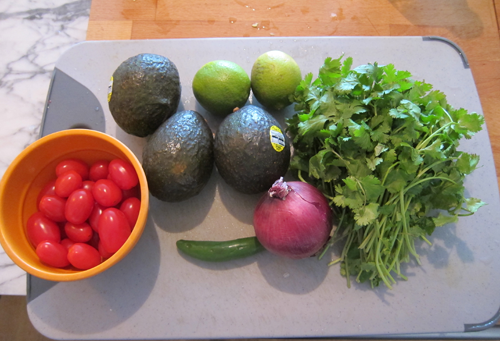 Any delicious, preferably organic tomatoes would make a great Mediterranean-style salsa! This salad is very simple, and looks fabulous. 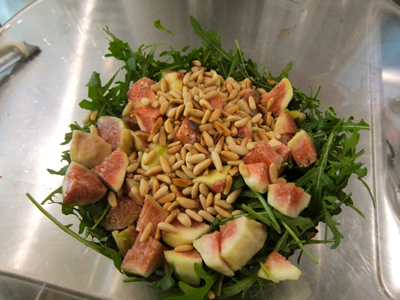 The sweetness and texture of the figs, the crunch and earthiness of the pine nuts, the crisp and slightly bitter arugula leaves… all make for a beautiful, delicious salad. To make: toast pine nuts in a non-stick pan at low heat. No need to add oil. Keep moving around and toast until the nuts turn a light golden brown color. Take about 6 figs, peel, and chop up into bite size pieces. In a bowl, toss together arugula leaves, figs, and pine nuts with a drizzle of olive oil, good balsamic dressing, and a sprinkle of salt. Enjoy!